Adventures in the Endless Pursuit of Entertainment: Speech of the Night! 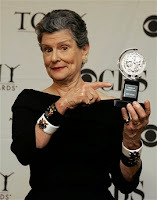 By Mary Louise Wilson, a 44 year Broadway veteran, winning her first Tony for Best Featured Actress in a Musical: Everybody has been so articulate. Um. WHOOOOOOOOOOOOOOOOO! You know, when I used to think if I would ever possibly win one of these, would I feel like there was a mistake made, would I feel that way. I don't. With all due respect to my fellow nominees, who are also great, um, I'm kind of bad on the connective tissue, I kept trying to think of the right grammatical connections, but I know I'm not here, I wouldn't be here if it wasn't for Grey Gardens, a simply brilliant show with a brilliant part. I owe everything to Scott Frankel, Michael Korie, Michael Greif, Doug Wright, and the incomparable Christine Ebersole. And I want also thank the brilliant agenting of Peter Strang and my beloved friend and stylist Vangeli Kaseluris.